A crowd of lucky spectators were treated to a heartwarming sight last week as a wild sea otter mother drifted into view with her little pup napping comfortably on her belly in the cool waters outside of Monterey Bay Aquarium. Fortunately for the rest of us, photographers were on hand to capture the adorable pair on film. This sweet display of familial harmony was made possible, in no small part, thanks to the tireless work of marine conservationists. Despite their undeniable charm, sea otters in California were once driven to near extinction by fur trappers. 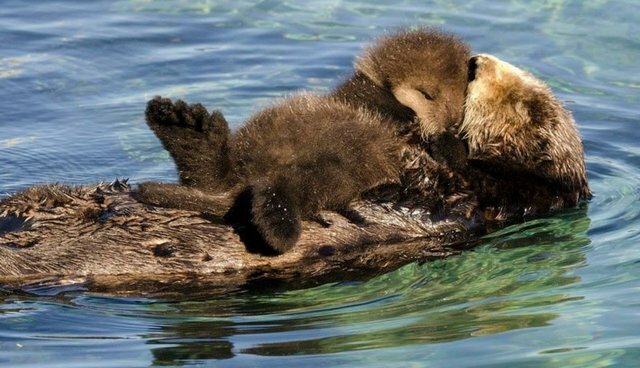 From a group of only about 50 sea otters in 1938, today's population has rebounded to just over 2,000 -- making this scene of a mother and her healthy new pup not only heartwarming, but heartening as well. "Our [Sea Otter Research and Conservation] program has been studying and trying to save the threatened southern sea otter since 1984, so we were thrilled by this visit!" writes the aquarium. "It's a case of cute overload!"